What is a truffle? 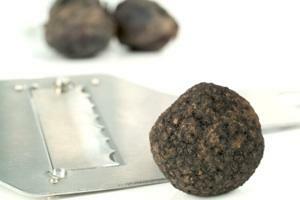 There are several kinds of truffles in the gourmet food world. Here you will learn about the type that grows in the ground, or truffle mushrooms. Truffles are a kind of subterranean fungi, meaning they are a mushroom that grows underground. Most commonly found in Europe, Asia, North America, and North Africa, truffles tend to grow in forested areas around the base of trees. Truffles are still hunted by pigs, which is the traditional way to find them, but these days more and more dogs are being recruited for the job as they can be trained to not eat the little prizes. Tuber melanosporum, or the black truffle, is a variety that was originally found in the Périgord region of southwest France. 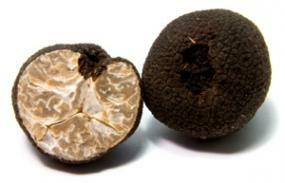 The black truffle is commonly used in all sorts of dishes, such as foie gras and soups. It is also turned into a luscious oil that can be drizzled over almost anything to enhance its flavor and provide a luxuriously rich taste. A cold-weather fungus, black truffles can be found growing under oak trees from September to December. This tasty little morsel can sell for as much as $400 a pound. Tuber magnatum, or the white truffle, is an Italian mushroom. This variety was originally found in the Piedmont region of northern Italy, in the countryside around Alba. While there are other similar white truffles found in Italy, those from Piedmont are considered more aromatic, and therefore fetch a substantially higher price - Alba white truffles can sell for as much as $2200 a pound! White truffles can be found growing in the vicinity of oak, hazel, poplar, and beech trees, usually in the autumn and winter months. They are used in a variety of dishes, such as risotto and seafood, and can be turned into flavored oil just like their French counterparts. While all truffles have an earthy flavor, each kind has its own distinct taste and fragrance; white truffles have a creamier taste, while black truffle are known for their woody notes. If you are interested in experimenting with truffles, you should consider picking up a bottle of truffle oil. There is nothing quite like the taste of a truffle, and even a light dab of truffle oil can take a dish to new heights. This kind of truffle is actually a mushroom! There are many different subterranean mushrooms that closely resemble the kinds prized by cooks, but not all of them are edible. In fact, some are poisonous! Hunting for mushrooms is something that should not be undertaken lightly - do not eat any mushrooms that you find unless they have been checked by an experienced mushroom gatherer or professional mycologist. If you are serious about learning about the different types of mushrooms available in your area, consider taking a class or joining a local mushroom gathering group. This is not an area in which to push your luck! Every year hundreds of people die or are permanently injured due to consumption of toxic mushrooms. Not to be confused with their savory fungal counterparts, chocolate truffles are also a highly prized treat. Chocolate truffles share nothing with their mushroom counterparts except their approximate size, shape and the appreciation of gourmands. If you are interested in making chocolate truffles, here is a recipe for chocolate cheesecake truffles. Here is a good source of food facts about truffles. Chef Massimiliano Convertini talks about white truffles. Tips on using and storing truffle oil. These days, you can even purchase truffles online!